Looking for a feature-packed web hosting service that won’t have you digging deep into your pockets? You might want to check out 1&1’s web hosting solutions. This company has set its sights on getting newbies and every last technophobe online. This isn’t an easy task, considering that a staggering 60% of small businesses still don’t have a website. Without a website, you’re missing a lot of great opportunities to reach an even wider audience that could turn into buying customers, thus limiting business growth. This is why 1&1 are pumping their marketing efforts by spreading the word through TV ads and other forms of media. 1&1 claims to be one of the web hosting companies that guarantee a higher level of customer satisfaction. But just like the rest, there are upsides and downsides to using their hosting service – which brings us to this review. The main goal of this 1&1 in-depth review is to let you know whether or not their Linux and Windows web hosting solutions are for everyone. I’m going to explore each of their hosting plans and the features that come with them, the quality of their customer support, the type of control panel they use, their add-ons and extras, and of course, their pricing. These – and more – will hopefully help you make an informed decision. 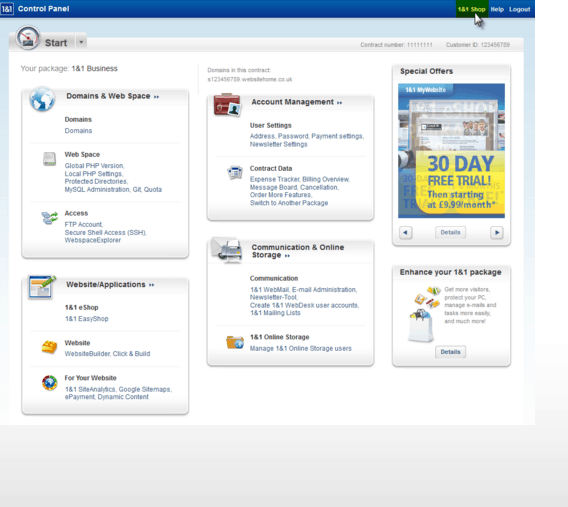 1&1 Web Hosting – What’s Their Story? Choosing a reliable and budget-friendly web host is important and 1&1 aims to make this decision a simple one. The company was founded 26 years ago, and has since grown into an industry-leading company that offers a wide range of products to various international markets, particularly web hosting. They currently offer a plethora of web hosting products, including advanced email solutions and high-end servers in more than 10 different countries including the US, the UK, Spain, and Germany. 1&1 launched its complete line of web hosting products in 2004 and has since become one of the top web hosts in the US. The company is focused on providing optimal online presence for small to medium sized businesses. In 2008 they opened a 55,000 square foot data center with 37,000 servers, located in Lenexa, Kansas. Their products are available not just in the US but also in the UK, Spain, Germany, France, Austria, Canada, Poland, Italy, and Mexico. Today, there are over 7,000 employees working for 1&1 from all corners of the globe. They have a large community of more than 6 million clients. In the first quarter of 2012, the company boasted earnings of $576 million, of which $185 million was allotted to their advertising budget. Because of this, many users found out about their offers through TV and print. 1&1 is one of the most financially stable and profitable web hosting companies in the market that continues to grow to this day. 1&1 has a solid selection of web hosting packages, including shared hosting, cloud hosting, VPS hosting, dedicated hosting, as well as managed WordPress hosting. I believe it’s one of those rare hosting options that managed to perfectly combine cost-effectiveness with functionality. This hosting provider aims to provide clients with everything they could possible need to run and manage a successful website with ease and efficiency. Besides domain registration and email services, 1&1 offers a wide range of Linux and Windows hosting solutions. 1&1’s entry-level hosting packages are ideal for web developers who are looking to build a small website and require cheap hosting. Their shared hosting plans come with the necessary features to build simple and workable HTML-based sites. The great news is that 1&1 offers both Linux and Windows hosting. Neither the Linux and Windows platform can be viewed better than the other, as they’re both top-of-the-line and capable of hosting your domains. The only difference lies in the client’s preference. Another factor to consider for choosing your hosting OS is based on your programming skills. Linux and Windows are using different script and database languages. If you need special Windows script languages like ASP.NET for building your site, then Windows hosting is the one for you. If there’s no need for ASP.NET or MSSQL, then Linux is the OS of choice. It won’t matter if your computer runs on Windows, though, because all computers can communicate with Linux or Windows servers. Once you determine how you want to build and manage your site, it’ll be easy to choose the right shared hosting platform for you. 1&1 provide three different shared hosting packages: Unlimited, Unlimited Plus, and Unlimited Pro. All of these plans can be purchased either with Linux or Windows server, with no difference in pricing. If you want a basic online presence, the Unlimited plan is the ideal solution. It comes with unlimited disk space and allows you to host unlimited websites. If you have more advanced websites in mind, you’ll find great value with their Unlimited Plus package where you get unlimited resources for dynamic and interactive content. For premium features and guarantee performance, on top of 1&1 App Expert Support, you can go for the high-tier Unlimited Pro plan. I recommend this plan for those who are looking to build a robust business website. All these hosting plans come with 1 free domain for the first 12-month contract term. You can choose a domain from a list of extensions like .com, .net, .org, .info, .us, .co, .biz, and more. 1&1 does many things right. Their shared hosting plans are some of the most feature-rich I’ve seen so far, and they even come packed with easy-to-use website building tools. Their hosting options are competitively priced, too. 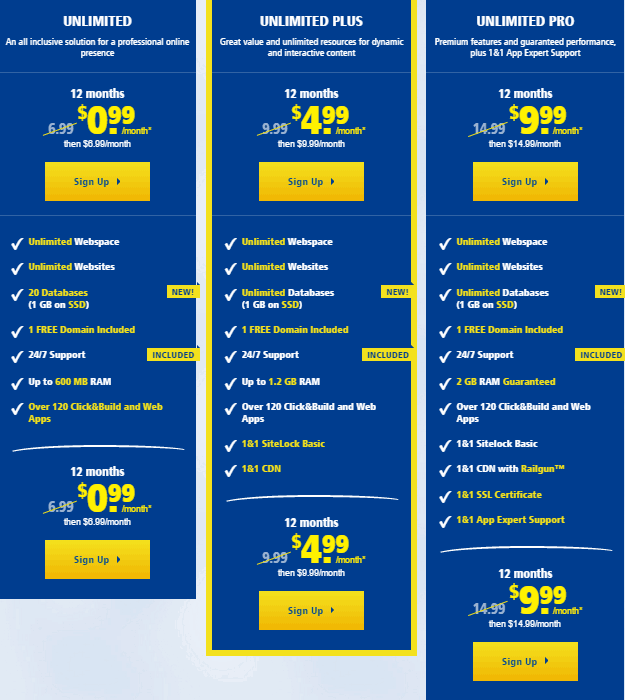 In fact, their shared hosting plans are some of the cheapest around. They offer unlimited disk space and email accounts in all of their plans, and they’ve thrown in a free domain too. They also stand out among their competitors in terms of security, as they offer SSH / SSI access and provide shared SSL Certificate to protect your customers’ sensitive information. Unlike in other web hosts, you don’t need to upgrade to a higher plan to get these security features. They even provide free backup! Overall, 1&1 is right on-par with top brands like BlueHost and iPage in terms of affordability and overall website-building flexibility. If you’ve outgrown your shared hosting plan and you need a more powerful hosting option that will give you increased power, performance and storage, perhaps it’s time to upgrade to a more robust VPS plan With a VPS plan, you can greatly benefit from maximum availability, optimum performance, and professional service. You can still choose between Linux and Windows, with multiple versions for each platform. 1&1’s virtual server gives you a wide range of possibilities so you could experience all the same benefits as a more expensive dedicated server. And when it’s time to upgrade, you can easily scale or switch to a larger server at any time. With a VPS plan you’ll get a professional high-performance server with multi-core processors and RAID protected hard drives that ensure you’ll get the best performance and highest level of data security for your site. It also has a significantly larger capacity than a shared hosting plan, where you can have up to 12 GB RAM and 400 GB worth of disk space. You’ll also get unlimited bandwidth. Now, you add a variety of different applications to your heart’s content, and your site can better handle the rigors of the Internet better than basic web hosting! 1&1 allow you to choose from 4 different VPS plans: VPS M, VPS L, VPS XL, and VPS XXL. Their VPS offerings give you the essential tools for building a truly professional website with ease. The new WordPress Toolkit that’s added to the package is particularly appealing as it allows for mass management of WordPress installation, including scanning and detection of possible threats, handling plugins and upgrades, and more. 1&1 is really playing well with their offerings, despite placing limits on disk space and other resources. They make up for this by adding plenty of useful features and tools, including access to the 1&1 control panel and Parallels Plesk. Like their shared hosting plans, their VPS plans are pretty cheap, too. For those who are looking for the very best in web hosting, then a dedicated server is your key to unparalleled performance and storage. You can choose from three Linux- or Windows-based dedicated hosting packages: Entry-Level Servers, Performance Servers, or Business Line by Dell. Starting from a monthly price of $34.99, you can get your own Entry-Level dedicated server where you can get up to 16 GB of RAM, 1.5 TB of disk storage, unlimited bandwidth, and many more. Right now, 1&1 is even offering a special promo called Power Deals, which lets you enjoy select Entry-Level Server plans for FREE for the first 3 months. You read that right, 3 months of free web hosting! Check out the comparison chart below to find out which of these plans are covered by the Power Deals promo and take advantage of this money-saving opportunity. You better hurry though, because there are very limited slots left! The specs are fine if you’re managing a smaller, lightly trafficked site but if you want more out of a dedicated server, I suggest you check out the Performance Servers (from $99.99 per month) and Business Line (from $224.99 per month) plans which offer beefier CPU and storage options that are just as powerful as the dedicated hosting options of many other top web hosting providers. Want to have your own server that’s specifically tailored according to your needs? Why not go for managed server hosting? With managed hosting, you get an all-access pass to your very own dedicated server, complete with a specific hardware configuration and a dedicated IP address – all made available by 1&1. Managed hosting lets you focus on what you do best: managing your business. So while you’re busy growing your business, 1&1’s team of experts will take over the management and maintenance of hardware and software updates, as well as the security architecture. You can still access your managed server for setting up domains, emails and databases, or allocating resources for your projects. You can still install the applications you need to run your site or project via the 1&1 Control Center. Manager server hosting is the perfect solution for small to medium size projects. If you’re on a tight budget, this is the way to go, too! It doesn’t have to be a dedicated server because you can also have a managed virtual server. Unlike a dedicated server that’s based on a hardware that’s used exclusively by you, a managed virtual server lets you shared hardware with other users. However, if you’re planning to run larger, more complex projects where hosting performance is vital, then a managed dedicated server is a better option. 1&1’s managed dedicated server is available in several different formats. You can allocate hardware resources such as processor capacity, disk space, bandwidth, and RAM whenever necessary. This way, you can find the perfect solution for your hosting needs without risking performance. As you can see, you’re spoiled for choice with pretty good managed hosting plans. They’re not exactly the cheapest in the market but you can see where your money will go. So if you’re willing to shell out more cash in favor of a more robust hosting package that’s specifically designed for you, consider 1&1’s managed server hosting. 1&1 give you two ways to get your WordPress blog or website up and running on their hosting platform. Firstly, you can install the WordPress application on a standard Linux- or Windows-based server environment through one of their hosting plans. Secondly, you can sign up for one of their managed WordPress hosting plans. You can either create a WordPress blog with 1&1 or download it from WordPress’ official site. There won’t be any difference! You’ll automatically get the latest WordPress software no matter your choice. You can also opt to activate automatic updates with 1&1 which will ensure your blog stays up-to-date with the latest standards. Either way, you can enjoy the same customization possibilities that are available with WordPress, and you can install the same themes, plugins and widgets you’ll find with other hosting providers. If you choose 1&1’s managed WordPress hosting, however, things will be made a lot easier for and you can concentrate on the most important aspects of your site, which is creating and publishing a beautiful design and attention-grabbing content. 1&1 will handle all the heavy work for you! With just a few simple clicks, 1&1’s setup wizard will take you through the entire process from the ground-up. They will then handle the backend of your WordPress site, including speed, security, and updates. Unlike standard WordPress hosting, managed WordPress hosting provide the essential processing power and memory capacity for your WordPress site. Their budget-friendly hosting plans are also customized for WordPress project requirements so if your project grows and you need more space, you can easily scale order it. You can choose from three 1&1 Managed WordPress hosting plans, namely Managed WP Basic, Managed WP Plus, and Managed WP Unlimited. 1&1’s managed WordPress hosting plans are clearly more feature-rich than the ones you’ll find in many other hosting providers. Pricing isn’t all that bad, either. It’s definitely a good choice for those who are new to WordPress and/or don’t want the hassle of creating and managing a website. It’s worth noting that if you switch to managed WordPress hosting, it won’t be possible to switch back and the updates will be moved to you. But whatever your decision, trust that 1&1’s team of WordPress experts are ready to help you 24/7. Online shopping is so mainstream these days that most consumers are turning to the Web to purchase products from even the smallest companies. If you still don’t have an eCommerce site, then you’re definitely missing out on a lot of income-generating opportunities! Don’t lose against a competitor that’s already established online. Now is the perfect time to create your Web presence by building an eCommerce site with 1&1! Online Store Starter: Gives you access to a 24/7 hotline for customer support, and sets you with a powerful yet easy to manage eCommerce site. It also includes a built-in software that’s ideal for running an online store, plus unlimited traffic. You can list up to 100 products in your site, as well. It’s the perfect package for beginners who are just about to enter the world of eCommerce. Online Store Basic. This package lets you offer up to 1,000 products and gives you access to 1&1’s SEO Cockpit feature which optimized your site’s online visibility among popular search engines like Yahoo! and Google. This way, it’s easier for people to find your online store and products! Online Store Plus. With this package, you can offer up to 10,000 products on your eCommerce site, and choose from more than 30 different shipping methods. Other notable features include the option to connect your store with Facebook, and enhancing your product listings with photos and text. Online Store Unlimited. As the name implies, this package gives you a set of unlimited features like unlimited product listings, shipping methods, and currencies. It comes packed with an extensive set of software tools. Your customers can even create their own online discounts! It’s worth noting that the Online Store is not a hosting plan, but rather an eCommerce add-on. There seems to be a lot of dragging and dropping and adding pre-made elements, and there isn’t much you could manually tweak. 1&1 will require you to enter your sales ID tax and whether you want to display items with or without the sales tax included in the price. Also included in the package is a customer database for keeping track of your customers. Another cool feature that’s included in this custom control panel is its click-and-build applications. 1&1 give you access to over 140 different applications, ranging from full CMS systems like WordPress and Drupal, to messages boards, galleries, and more. You can add these apps to build and further enhance your website without extensive effort or web design experience. 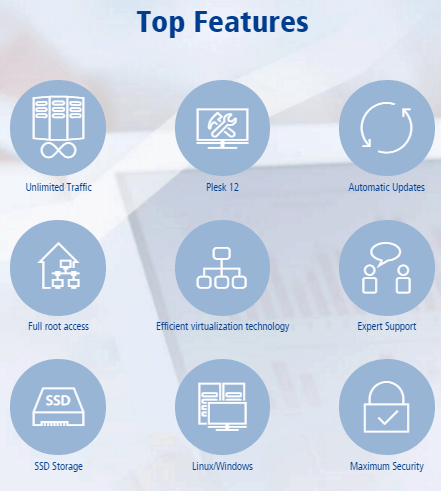 The Plesk control panel is available in 1&1’s higher hosting plans. It’s one of the most popular control panels in the industry, and is loved by many for its ease of use. With Plesk, you can complete control over your server. It allows you to manage and process all of your server’s functions, letting you set up user accounts, domains, and email addresses with minimal effort. With menu-controlled updates and service installation, your server will be kept up to speed with the latest technology. Plesk has a very simple yet powerful web interface. 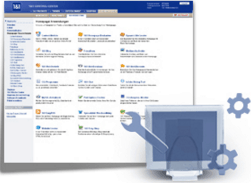 With just a few simple click, you can gain access to user account administration, configuration, and settings. What’s more, you can customize the web interface’s design to your needs and preferences. And since you’re the server admin, you can toggle between different views and roles whenever you please. Neat! Uptime and Performance – Is 1&1 Reliable? Server uptime is one of the most critical aspects of a hosting service. If your site is down, your customers won’t be able to find you or access your products and/or services, causing you to lose revenue. It’s quite surprising that 1&1 does not provide an uptime guarantee. They mentioned a “nearly 100% uptime somewhere in their site, but there was no mention of a prorated refund in case of lengthy downtimes. So how are their clients supposed to know that their websites will be up and running most of the time and will be compensated in case of an outage? 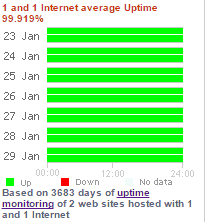 For your peace of mind, I conducted an online research to find out this web hosts uptime track record. According to BestHostRatings, 1&1 has an average uptime of 99.9%, based on a 3683-day monitoring. The data above reveals that 1&1 is just as stable as the top names in the web hosting industry, so you can count on it to be a rock-solid foundation for your site. As mentioned earlier, 1&1 boast more than 70,000 servers in their top-of-the-line data centers, located in the US and Europe. It’s the highest level of technology you can get with a hosting service, with multiple redundant junctions between data centers. To prevent any delays in data transfers, these data centers are configured with multiple redundant connections to the most important Internet hubs. 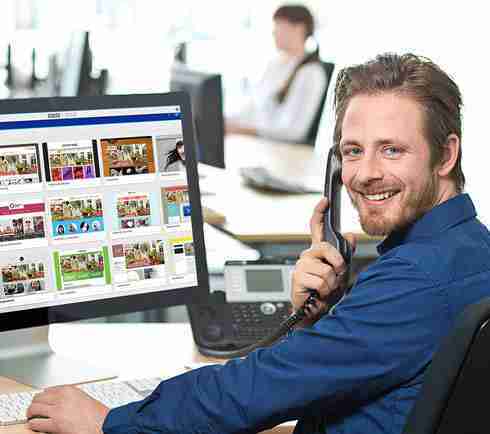 With this level of connectivity, your website will have faster loading times and higher multi-user capacity. If issues arise from single providers, this can be counterbalanced by redundant partnerships to ensure that your site is online at all times. 1&1 assure that you’ll be satisfied with their service. This, however, doesn’t mean that you’re completely sold, which is why they provide a standard 30-day money-back guarantee in case you’re not completely satisfied with any of their products. This means you can cancel your hosting account within 30 days from the date of the original purchase. Whatever the reason, you can get your money back in full – no questions asked. 1&1’s money-back guarantee applies to all their Linux and Windows web hosting plans. The refund applies to monthly fees and setup fees, including any add-on products or services you’ve added to the customer shop within the first 30 days of service. You may contact customer service within 30 days to request a full refund. Like their hosting plans, 1&1’s help and support system is right on par with the best web hosts on my lineup. So if you have any problems with your hosting account or you simply have a question that needs an answer, rest easy in knowing that this web host has 24/7 email and phone support. Even their billing department is available 24/7, which was previously only available on weekdays from 9AM to 5PM EST. How a web host’s customer service department responds to their clients’ queries or complaints is important, so I tested their phone support on a weekday afternoon. Less than 3 minutes later, a customer representative fielded my call. The rep I spoked to was friendly and helpful, and he provided informative answers to my questions regarding WordPress hosting. Unlike BlueHost and eHost, however, 1&1 lacks live chat support. As a result, I decided to test the other side of their customer service which is to send them an email on a weekend morning. Amazingly, I received a reply in just a couple of hours, with the email containing detailed and correct answers to my queries. Talk about fast and responsive! Besides telephone and email support, 1&1 provide a range of useful online resources that you can refer to as you set up your hosting account or build your site. From their site, you’ll find an in-depth FAQs section with lots of useful articles regarding their hosting service and its features and functionalities. 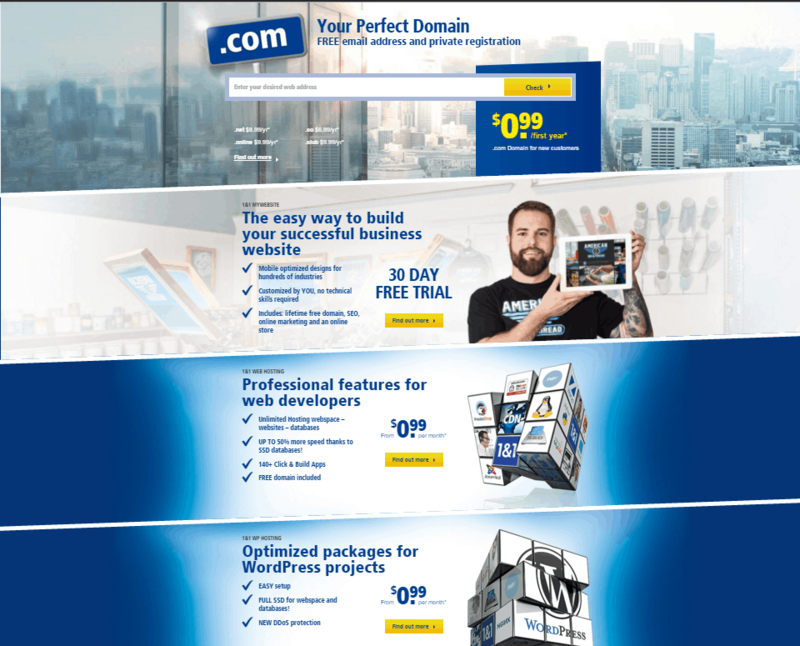 There’s no doubt that 1&1 is one of those web hosting providers that give their clients the exact things they paid for. They offer low-cost hosting, user-friendly control panels, top-notch customer support, and all the right features and tools to create a strong online presence. There may come a time when some of their plans are quite expensive, but there’s no denying that you can get a lot of value from what you get. That said, some of their hosting features could use some more flexibility. If you’re looking for other great alternatives, consider checking out my in-depth reviews on BlueHost, eHost, and iPage. Who knows, they might just be your best bets. 1&1 offer reliable and affordable hosting packages, with good support and impressive uptime reliability.